So here’s the deal, we constantly settle for “what we know” and “what has worked before” in business, community engagement and mural making. We often implement projects that benefit communities based on “expert” knowledge without consulting those who live with the deliverables. However, I believe my clients already or are prepared to make room for innovative methods that do more than achieve tangible results yet are truly participatory and establish lasting effects for all those involved. Businesses (that’s museums, brands, social enterprises) providing an “outside the box experience” to engage the public or clients around their brand. 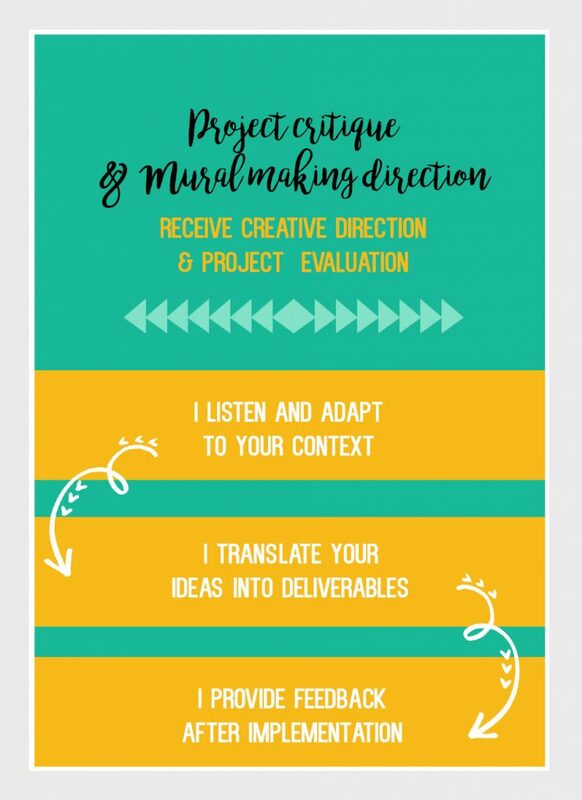 Whatever your client profile I believe you can benefit from an artist (this makes me uber creative) with an international development background who listens, facilitates project design and implementation guided by your genuine needs. Learn about working with me below or take the first step and fill out my contact form so we can start working together. I am a community muralist, emphasis on COMMUNITY and COMMUNITY PARTICIPATION. My mural-making process creates a “common union” and enhances education, dialogue and action towards a vision. 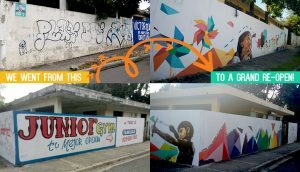 Beautify your community and give the participants ownership of the process. 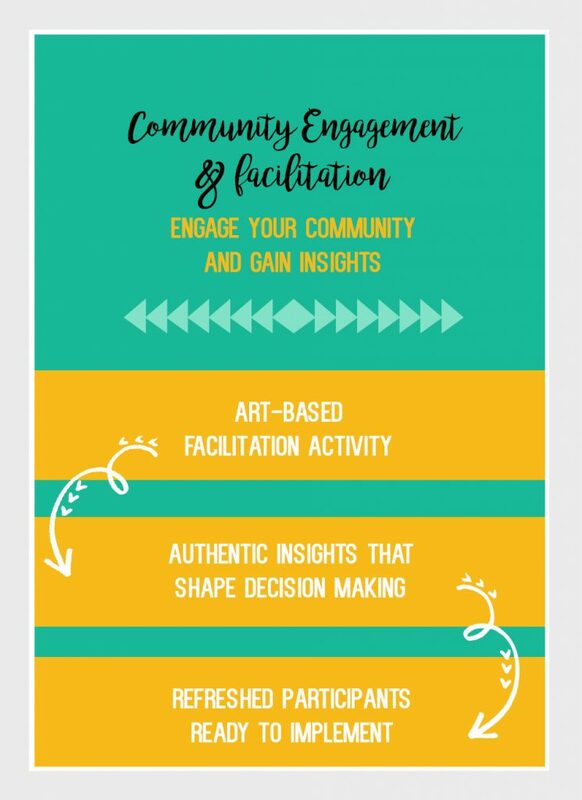 We enhance a community’s physical infrastructure and my participatory methodology brings all members and stakeholders to the table to paint which provides space for dialogue & exchange. Businesses have the opportunity to engage the public around their brand creatively and tell a deeper story. To achieve a community mural, I facilitate a vision workshop from which I create the mural design. Next I present the design for your approval and we collaborate the entire step of the way from mixing paint to inauguration. For brands looking to engage their consumers I provide an interactive mural at festivals, company events, etc. that facilitates engagement with your brand. Our beautification projects have the power to inform planning, policy making, and decision making. We completed this mural in June 2016 and in September 2016 local stakeholders re-opened a subsidized food cafeteria. Who wants to maintain a dilapidated building nestled within colorful walls. We can develop healthier spaces for inhabitants to dwell and redesign an entire community scape! My projects range from $1,000 to $5,000 USD depending on size and implementation. As a community development practitioner I am so satisfied when participants own their needs and then design the solutions to meet them. Communities benefit when we create an environment for change and I do just that, curate activities and spaces that value participants as they are so that we can decide upon the actions and pace that is feasible for their development. First, I provide facilitation within a space for participants to share needs, solutions and existing knowledge. Next we exchange “know how” and provide value-added resources to help implement development goals. I guide the decision making process and lead our communities to results that when community-driven can be sustained. As a result we innovate how we gain insights (evidence and participant input) that informs decision and policy making. My community engagement and facilitation services range from $500 – $3,000 USD depending on project depth and goals. Have no fear, the International Muralist is here! We all meet an impasse in our work where we need an expert critique and revision for our ambitious projects. I am an excellent resource, project manager and consultant that will take your initial idea and whip it into shape ensuring it is “implementable”. I have managed small scale to 6 figure project budgets, written grants and I am constantly managing a diverse team. So I am your girl if you want creative direction, mural making guidance or good ole “let me know how to make this better” advice. Participatory mural making is a methodology I have learned from others and mastered and there is no reason why all this knowledge should stay with me. 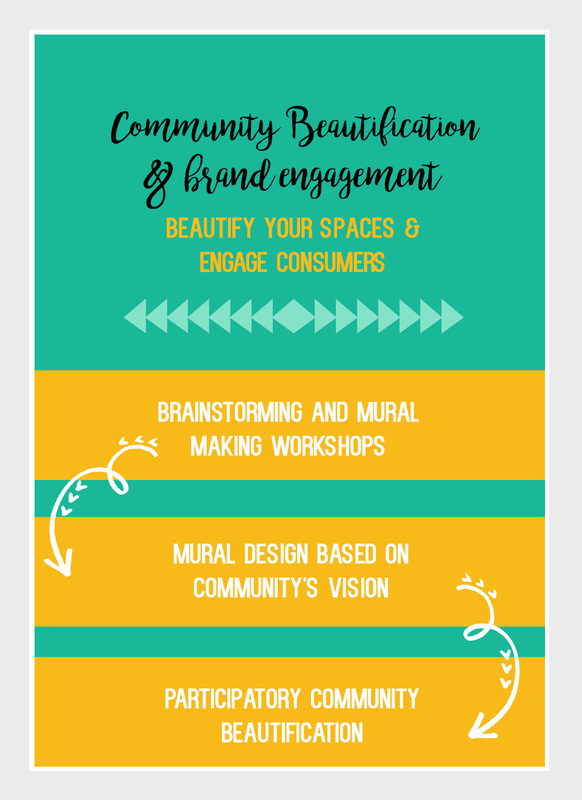 I am more than excited to provide consultation for mural making that adapts to your community context at whatever artistic skill level you find yourself and your community. I also critique and provide consultation for community project design and implementation. What tools and resources are needed for implementation and answers to all of your concerns!